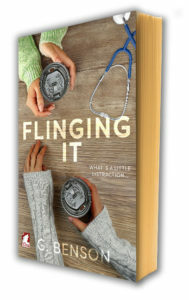 Flinging It (2016): Frazer, head midwife at a hospital in Perth, Australia, is trying to make her corner of the world a little better by starting up a programme for at-risk parents. Not everyone is excited about her ideas. Surrounded by red tape, she finally has to team up with Cora, a social worker who is married to Frazer’s boss. You can find “Flinging It” at Ylva Publishing.